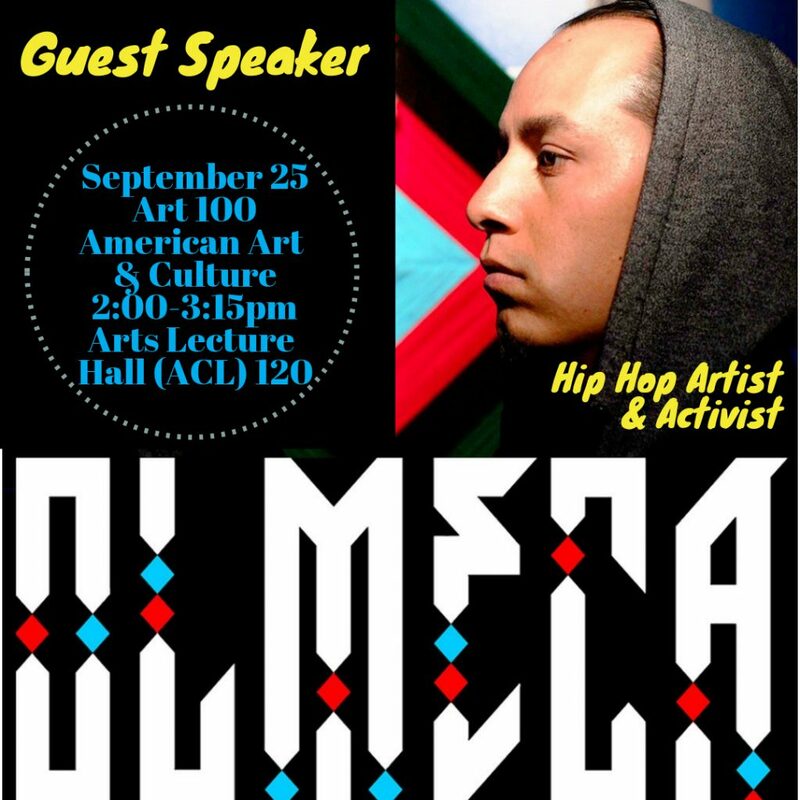 Hip Hop Artist and Activist, OLMECA will be a guest speaker for the third year in a row in ART 100, American Art & Culture from 2:00-3:15pm on Monday, September 25th. The talk is open to the public and will be held in Arts Lecture Hall (ACL) 120. Olmeca is a Bilingual Hip-Hop artist and producer. His work has been featured on CNN Latino, ABC, BBC World, Fox, NPR, URB Magazine, and television series, “Sons of Anarchy.” He has collaborated with numerous Grammy artists including Ozomatli, Marisoul of La Santa Cecilia and shared the stage with KRS-One, Jenni Rivera, Dilated Peoples, Ana Tijoux amongst others. Olmeca grew up in the barrios of L.A. and Mexico, a reality that brewed his blending of music genres and cultural sensitivity. Olmeca is considered one of the most exciting and dynamic artists and one that can coexist between hip-hop and Latin alternative audiences. He has toured Canada, Latin America and Europe and has helped generate a new trend of Latin music in the United States.